Something is terribly wrong at 343 Temple Drive. Company's coming, and Veta Louise Simmons and Myrtle Mae Simmons are worried that Harvey might show up. He's the 6-foot-1 rabbit who's the "imaginary" friend of Elwood P. Dowd, their 47-year-old "home boy" who drinks too much and flirts too much. Veta's angry because she didn't get any of Elwood's trust fund, she just can't seem to marry off her horsey-looking daughter, and they are forced to live under the same roof as the man whose limb doesn't belong on the family tree. And so they decide to commit him to a loony bin. Something's terribly wrong at the South Park Theatre. Its production of Mary Chase's Pulitzer Prize-winning play Harvey is, well . . . "amateur" fits quite nicely. 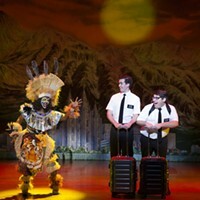 Community theater is risky: It must achieve (and maintain) a certain professionalism, or else it straddles that blurry line between ridicule and dismissal. This production comes within a hare -- oops! hair -- of falling deep into a rabbit hole. Don't let the fun fool you. The comedy's dark side reveals an alcoholic's friendship with an invisible spirit who keeps him sane while the world around him is going crazy. The major problem is the acting. As Veta, Toniaray DiGiacomo was the worst culprit. At the opening-week matinee, she seemed lost and forgetful; she knows she's on stage, she knows she's in a comedy, but if she's going for characterization with all the mumbling and stuttering and forgetfulness, it ain't working. Elwood, meanwhile, is the glue of Harvey. While Thomas Mokwa doesn't mimic James Stewart (who starred in the 1950 film), his Dowd is too bland, too mechanical. Wry wit? Too-dry wit. 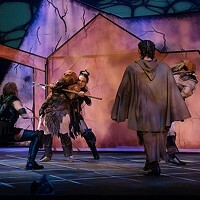 The play's charm lies in its wacky and flawed characters, but Mokwa offers meager charisma and charm, necessary elements for a character so uniquely drawn. Maybe a dose of White Rabbit would help? Rick Campbell directs with a heavy hand. Action that should move swiftly moves at a tortoise's pace: Act I clocks in 90 minutes. Aren't rabbits supposed to do things quickly? Matters aren't helped by the set, so poorly designed that blocking cannot be anything but awkward. There is one shining light: Adam Chisnall, here making his South Park Theatre debut. His take on orderly Duane Wilson is deeply steeped in horror-film icon Dwight Frye ... he's fey and fun and over-the-top, and one wonders just how much he's having with the audience when he eyes a male cast member and coos, "You're not so small yourself, Doctor." Chisnall is talented enough to wear the bunny slippers. Even Harvey would approve.